Customers Sue Target Over Credit Card Breach : The Two-Way Traffic at stores also declined following a security breach that may have exposed the credit card information of 40 million customers. A couple of shoppers leave a Target store on a rainy afternoon in Alhambra, California. At least 11 customers have filed lawsuits against Target over a security breach that exposed the credit card information of 40 million customers. "The lawsuits, each seeking class-action status, have been filed in US courts in the past several days. "Meanwhile, major US banks have moved to limit damages by limiting spending on debit cards. "Security researchers said the stolen card numbers had been seen on underground markets." 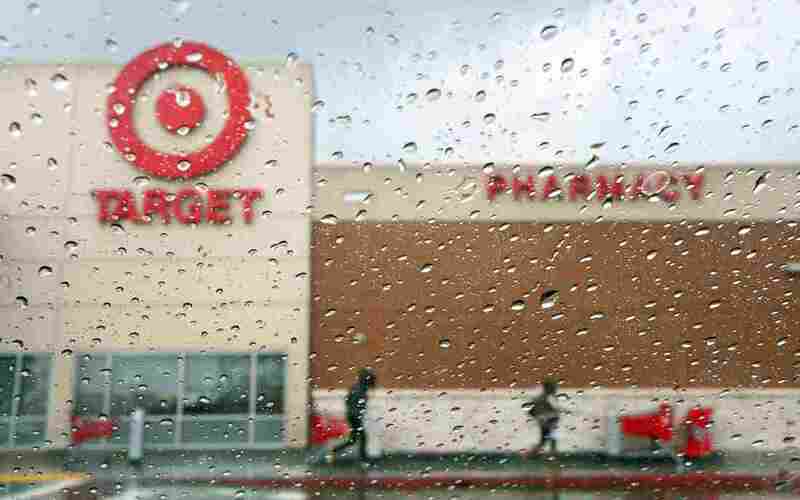 Bloomberg reports that one of the lawsuits filed Friday in San Francisco alleges invasion of privacy and negligence on the part of Target. "Target failed to implement and maintain reasonable security procedures and practices appropriate to the nature and scope of the information compromised in the data breach," Bloomberg quotes the complaint as saying. Meanwhile, The Wall Street Journal reports that the big retailer saw the number of transactions slip 3 to 4 percent year-over-year this weekend. Other retailers saw strong sales. "A spokeswoman for Target declined to comment specifically on this weekend's results, saying the retailer reports sales on a quarterly basis. Target tried to limit the damage by offering a 10% discount to all customers in its U.S. stores over the weekend, and analysts said that effort helped. "'This is the worst possible time something like this could happen,' said Craig Johnson, president of Customer Growth Partners. His firm estimates that U.S. retail sales on Saturday totaled $17 billion, exceeding those on Black Friday by $2 billion. "'Still, American consumers can be forgiving if you're honest with them—and the discounts help.'" Target offered customers a 10 percent discount over the weekend. And as we reported, JPMorgan Chase put limits on their customers who had used their credit cards at Target in recent days.